Since its release, the Building Envelope Thermal Bridging Guide has received significant interest from industry, building standard regulators, and energy efficiency programs. The Guide provides extensive resources on thermal bridging and contains over 700 pages of content with thermal performance of hundreds of details relevant to multiple construction practices. In order to facilitate the exposure, use and growth of this resource, we are proposing to develop a web-based application (App) to increase awareness of the Guide and make it easier for industry to use the information within it. 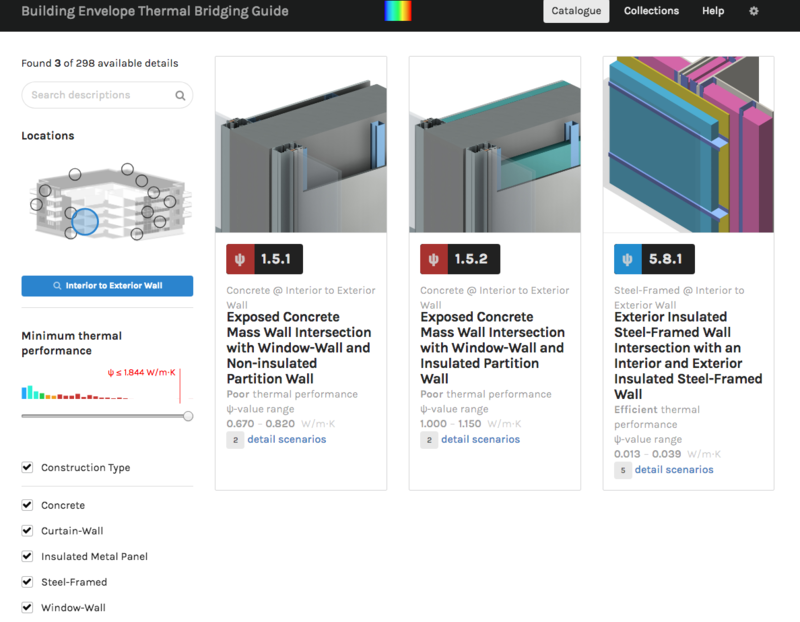 Provide an App that organizes Thermal Bridging performance data in an easily accessible way for a variety of user groups (e.g. Architects, Engineers, Contractors, Developers, Manufacturers, Government, Utilities, and Researchers). Provide an App that can be navigated efficiently on a variety of devices (e.g. tablet, smartphone, desktop). The design should deliver similar content across all devices and target the efficient use of code and content to minimize loading times. Provide an App that can facilitate the creation and management of content. The design should allow content managers to easily add new data, edit existing content, and change the formatting and organization of information. Provide a common place (i.e. website) for training videos, tools such as calculators, and an evolving data set. Phase 1 – MH, in collaboration with HPO, will develop a list of basic concepts, functionality and features, leveraging our understanding of the technical content, how users will most practically access the information, and the most efficient methods to convert the data to web/app form. Phase 2 – Develop a wireframe concept of the website by engaging a web/app agency, to be managed and coordinated by MH to ensure technical and usability integrity is maintained. Phase 3 – Full execute the production of the website / app by agency, with management and coordination by MH to ensure technical and usability integrity is maintained.